Founded in 1910, the Curtis Bay Towing Company of Baltimore, Maryland. 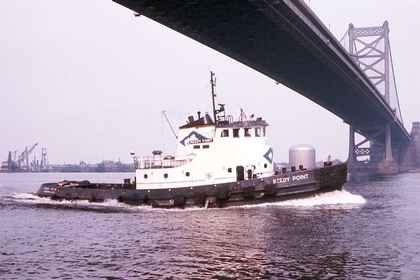 Originally started with a single vessel, named the Curtis Bay. Built in 1890, She was a former railroad tugboat. The Curtis Bay Towing Company was originally known as the Curtis Bay Coal Company and the Baker Whiteley Towing Company. In 1958, the company became an affiliate of the Moran Towing Corporation of New York, New York. And in 1988, Curtis Bay Towing became Moran Towing of Maryland, Incorporated, Moran Towing of Pennsylvania, Incorporated, and Moran Towing of Virginia, Incorporated, respectively. All subsidies under the Moran Towing Corporation of New York, New York. The portion of the company that was the Baker-Whiteley Coal Company. That served as the principal providers of marine towing services in Baltimore harbor in Baltimore, Maryland. Was acquired by McAllister Brothers Towing of New York, New York in 1980. Which became McAllister Towing of Baltimore, Maryland. A subsidy of McAllister Brothers Towing of New York, New York.